JFK spent most of the day in Nevada before traveling to Roseburg, Oregon. He started with a speech at the Las Vegas convention cener, followed by inevitable reception in the convention center Gold Room. 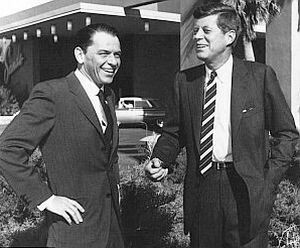 He then headed back to the Sands Hotel where he met with long time supporter Frank Sinatra. Afterwards, he flew to Roseburg, Oregon, where he was greeted by local officials and Kennedy campaign officials.